Or, get it for 84400 Kobo Super Points! Recent studies have indicated that epigenetic processes may play a major role in both cellular and organismal aging. These epigenetic processes include not only DNA methylation and histone modifications, but also extend to many other epigenetic mediators such as the polycomb group proteins, chromosomal position effects, and noncoding RNA. The topics of this book range from fundamental changes in DNA methylation in aging to the most recent research on intervention into epigenetic modifications to modulate the aging process. 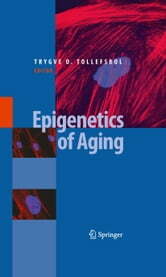 The major topics of epigenetics and aging covered in this book are: 1) DNA methylation and histone modifications in aging; 2) Other epigenetic processes and aging; 3) Impact of epigenetics on aging; 4) Epigenetics of age-related diseases; 5) Epigenetic interventions and aging: and 6) Future directions in epigenetic aging research. The most studied of epigenetic processes, DNA methylation, has been associated with cellular aging and aging of organisms for many years. It is now apparent that both global and gene-specific alterations occur not only in DNA methylation during aging, but also in several histone alterations. Many epigenetic alterations can have an impact on aging processes such as stem cell aging, control of telomerase, modifications of telomeres, and epigenetic drift can impact the aging process as evident in the recent studies of aging monozygotic twins. Numerous age-related diseases are affected by epigenetic mechanisms. For example, recent studies have shown that DNA methylation is altered in Alzheimer’s disease and autoimmunity. Other prevalent diseases that have been associated with age-related epigenetic changes include cancer and diabetes. Paternal age and epigenetic changes appear to have an effect on schizophrenia and epigenetic silencing has been associated with several of the progeroid syndromes of premature aging. Moreover, the impact of dietary or drug intervention into epigenetic processes as they affect normal aging or age-related diseases is becoming increasingly feasible.